The second demo I did was a high key one. It gave me a lot of color opportunity. I kept the pewter kettle in the back in a very unfinished stage in contrast to the details on the cup and apple. If it works, doing less is more powerful than doing more. Now the workshop is over. I hope everybody have enjoyed Putney, and the beautiful Vermont. I am in Putney VT teaching a workshop. I want thank Penelope and John for their warm hospitality and wonderful job of hosting this workshop. I want thank all my artists friends for attending. I feel so great coming back to this legendary place to teach and to learn. This painting is my first demo. I laughed when I read my own post I did two days ago. I was trying to say that I did a wash with “burnt umber and a lot of Gamsol” (a painting medium by Gamblin), but my computer is so smart and got its own mind. It changed “Gamsol” to “gambol” without letting me know. Did I paint with “a lot of gambol”? Maybe I did. As matter of fact, it would be even better if the computer wrote “I did a wash with a lot of gumbo”. Well, my today’s painting really looks that “I did a wash with a lot of gumbo”. It was done last night after a whole day of doing more “important” things: preparing data for the tax return, booking travel for next workshop, getting toner for the printer, modify my workshop presentation, printing out hundreds of handouts to my students, packing all my stuff for my Vermont trip.... to name a few. I was total exhausted in the evening, but I still decided to paint. Well, the result was not what I expected, but I share it with you anyway. Now I am on the plane from Dallas to Hartford. So I have a little more time to write. If you see any errors in my writing, it must be my computer interfered, not because I don’t know English good. This painting was my test of opacity over transparency. My background was a transparent wash with burnt umber and lot of gambol. I put it on with a piece of paper tower. I painted the Chinese food to go box majorly with a palette knife. I like the looseness of this one. I am still searching for my balance point between abstractness and realism. I think I am getting closer. With my recent small painting exercises, I have been trying to involve objects I have not painted or not often enough. I am taking baby steps so I will not get lost. Last one was green grapes, and this one peppers. Gradually I will cover all the objects I would like to paint. In general, I can paint anything I want. They are all shapes, values, and colors. However, if I don't do it, I would not know the characteristics of a specific object. In addition, I will learn pros and cons of using one type of objects for composition and designs in the future. For this painting, I didn't care too much about my artistic ideas (I used to do that a lot). I just want my brush work to show pepperiness. Coming back to my small painting study, I recall I was working on the color of green. People who have taken my workshop know that I like to use Phthalo blue mixing with yellow to get greens. This method works well for dark greens, but not good for lighter greens. So I start to add viridian and cadmium green pale onto my palette. For this small study I used Phthalo green. It works much better than my previous method. I learned this from Colley Whisson last week. You may add a lot of white to Phthalo green to tint it to a very light green, but the intensity is still strong. You can shift the green with yellows and dull it with red. I really like this color. It has the potential of replacing Phthalo blue, viridian, and cadmium green pale on my palette. Due to my previous green problems, I didn't paint green grapes often. Now I am more confident. It has been almost a week I didn't post anything on my blog. I was busy helping Colley Whisson who was teaching a workshop here. The workshop went very successfully. Colley was a great instructor, very informative and organized. I will definitely apply some of his techniques into my own art. The painting I posted today was done on his workshop. I copied one of his paintings. My landscapes still needs a lot of work, but I am so fortunate that I have great opportunities of being close to the masters. Now, I am sitting at my cube doing some technical work for my previous engineering company. My life is amazing, exciting, and busy. But my major concern is how to concentrate my limited time and effort to form a practical way that makes my art progress systematically. This is my first portrait painting this year. It is 9" x 12". I offer much lower starting price for it than my still life paintings, because I am still at the early stage of portrait painting. Tomorrow, well known Australia artist Colley Whisson will teach a 3-day workshop here in Austin. As the workshop organizer, I will be busy assisting him. I am really looking forward to see his techniques. By the way, I have announced a while ago that wonderful California artist Fongwei Liu will come to Austin to conduct a figurative workshop. I have got great responses on it. Fongwei is not only good at portrait and figurative works, he is also a wonderful plein air landscape painter. If you are interested in learning his plein air approaches, you have an opportunity. 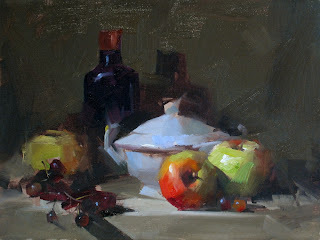 He will teach a plein air workshop in California. Please check Mammoth Lake Plein Air with Fongwei Liu for detailed information. Painting this small painting, I was really paying attention to the color harmony. I was using a halogen light for illumination, so the light was very warm. The background is a piece of white canvas, and the bottle is actually blue. To judge my color perception, I turned on my iPhone and placed a white screen on the display. I used this "iPhone white" as my standard, and placed it near my setup. I judged all colors I saw by referencing to this standard "white". In this way I see the background is so yellow, and the bottle is so green. If I didn't use this iPhone trick, my eyes would soon adapted the illumination and I would not have the color accuracy. You may want to try this too. Any electronic display with some sort of white screen will work. I have restarted my small daily painting again. recalling what I did before my Melbourne workshop, I was working on high key colors. With this painting, I worked on the color of green. Due to my limited experience with green colors, I have found that it is very difficult to obtain good greens by mixing blue and yellow. To get high chroma greens, I have to put more green paints on my palette. On this painting, I have used viridian (Rembrandt), cadmium green pale (W&N), yellowish green (Van Gogh), and Shiva yellow citron (Richeson Oils), plus phthalo blue and yellows. I have more green pigment I will test. Eventually, I will put my green issues under control. BTW this painting is 6"x8". I haven't done this size paintings for a long time. My 3-day workshop at Melbourne FL just completed today. I want to thank Carmen Beecher for organizing this one. I felt so wonderful coming back to this beautiful coastal city. I want to thank Mary and Joe Warnick for their warm hospitality. I want to thank all the artists attending. I was so great meeting you or seeing you again. This is my first demo painting. I did this small painting last night. Right before I was on my way to the airport, I snapped a photo in a rush. This is another high key painting. I am really into color now. My sense of color needs a lot of improvement. Without knowing much, I used most obvious approaches. I am on my way to Melbourne FL, having a workshop to teach. Now I am on the plane typing this note on my phone. I will let you know how the workshop goes in my next post. BTW I will go to Putney VT at the end of the month. On March 31, the Putney painters will paint together. If you are interested in join us, please contact Penelope Simpson for detailed information. I would love to meet or see you there. Several days ago, I thought I should do a painting for this year's OPA show. I got on my calendar trying to make a plan, but to my surprise that I found out the dead line of submission had already passed. This is the first time I missed the OPA show since I joined. This kind of things have happened more often lately. I felt like the rabbit in "Alice in the Wonderland", and being late for almost everything. I have spent two days on this 12" x 16". In May, I will be part of a three-person show in a gallery. I must crank more gallery paintings between my workshop teaching trips. With this painting, I really practiced how and what to paint on the second day. Naturally, I will get tighter. So I deliberately controlled myself not going that way. I worked on the edges and the design of supporting items. The result is not bad. When I was trying to concentrate on figuring out the colors and edges of the painting, I saw the white rabbit running in my mind, dragging a gold watch, crying "I am late, I am late, I am late late late ...".